Editor’s Note: The piece that follows is adapted from an interview with Thomas Gibney of Verwater Environmental Resource Systems. The Gazette has spoken earlier in favor of using professional carwash facilities rather than relying on fundraising events to keep your car clean or even doing it yourself in your driveway. The pros not only reuse water, they keep car wash chemicals out of the drainage system.–Hardly Waite. In years past vehicle washes weren’t too interested in telling the public that they reused the water because the consumers felt they were getting their vehicles washed with dirty water, and they were. In some systems sold yet today the water comes out a brown or grey color because the chemicals haven’t been removed in the treatment process. Today with the advancements in using natural bacteria to consume chemicals from the waste water like sewer treatment plants operate a vehicle wash can feel comfortable in advertising that they are washing the consumers’ vehicles with clean restored water. 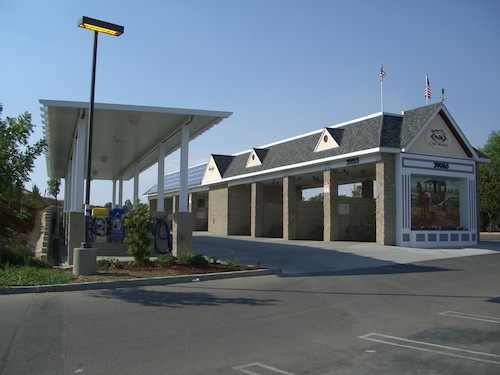 to ensure the wash stays open in drought periods but also to reduce water and sewer bills which add to the profitability of the wash.
Fundraising car wash events may be fun, but they are also an environmental disaster. Three types of reclaim systems are available today. 1. The first and oldest type is what I refer as a re-use system. This system relies on settling tanks to settle out the major solids so that the water can be sucked up and re-used on the vehicles. In all cases the water applied to the vehicle has a brown color. In warmer weather this re-used water emits a hydrogen sulphide odor which comes from the anaerobic bacteria growing in the water that is void of oxygen. 2. The second type is a filtration and ozone system which I refer to as a reclaim system. These systems rely on settling tanks to settle out the heavy solids and they use filtration of various forms to lower the solids down to 10 to 20 micron so as not to void high pressure pump warranties. The last treatment to the water is ozone to oxidize the natural anaerobic bacteria in the waste water so that the water doesn’t contain any odor when re-used. They do little to lower the dissolved chemicals used to wash and wax the vehicles so these remaining chemicals prevent using this reclaim water to mix again with chemicals, which lowers the overall re-use of the waste water. 3. The last system is a water restoration system. This type of system uses settling tanks to settle out the heavy solids as gravity is free along with hydro cyclones to lower the solid level down to 5 micro. The water is then aerated to switch the anaerobic bacteria to aerobic bacteria since aerobic bacteria are 90 percent more aggressive in consuming waste chemicals in the water. When these natural aerobic bacteria are present they consume the waste chemicals and turn them into CO2 and H2O. CO2 has no odor so these restoration systems never release that sulphur or rotten egg smell when the water is reused. With the chemicals removed by the bacteria this restored water can be re-used throughout the wash to include remixing with chemicals. Only the final rise or spot free rinse is fresh water which means a recovery and reuse rate of 90 to 95 percent can be achieved. Modern reclamation systems are capable of recycling 100% of all wash water that is captured. The newer technologies have changed things completely. Working with nature rather than fighting nature means the new technology of using natural bacteria to consume the waste chemicals and clean the water means they are easier to maintain, are less costly to keep working and the operators don’t turn them off before the first year of usage. The result is a higher entry cost for the equipment but a lower maintenance cost and a better quality of restored water to use throughout the wash process which means a better return on investment for years to come.